Yes, SoapUI has license version also. But I have not seen any other web service testing tool that has so many features completely FREE. SoapUI is the world’s most widely used open source cross platform API testing tool for SOA (Service Oriented Application) and web services. Its user friendly interface and rich features help to build an efficient testing environment easily. In SoapUI, you can invoke, develop and simulate a web service for functional, regression and load testing. SoapUI is the most downloaded testing tool in the World. It is easy to download and install on any operating system like Windows, Linux or MAC. To download SoapUI, click here. Even if you have never used SoapUI before, you will find it super easy to build complex test scenarios. Your testing journey in SoapUI starts with a project. Building a project in SoapUI is just a right-click away. You can easily import WSDL, pass arguments or create sample requests and verify responses within the project. Using SoapUI, you can automate the testing process as well. It supports a set of command line tools to automate testing using task scheduler. SoapUI gives option to add custom script also. This is what I like most about SoapUI. SoapUI mock service replicates the actual web service without building it. It eliminates the cost of building replicas of production environments. It allows to create a simulation of the web service before the actual web service becomes live. SoapUI supports third party plugins like SOA DataPro, TestMaker, Agiletestware. It is easy to integrate with IDEs like NetBeans, Eclipse and Maven. Developers can build their own custom plugin using SoapUI APIs. Do you need more features like test history, coding free test assertion, enhanced support? Go for SoapUI professional version (but it costs you). This is really cool… isn’t? If SoapUI is so powerful, why did I search for SoapUI alternative applications? You can say – 50% just out of curiosity and another 50% for simpler and lighter application than SoapUI. .. why you are looking for SoapUI alternatives? If you want to know more about web service testing in one training with certification and real time project, here is my recommendation – WebService testing with SoapUI – Realtime Proj + Certification by Testing World. Start with our first SoapUI alternative application – Apache Jmeter. Like SoapUI, JMeter is also free and open source testing application. It is purely Java based and platform independent application. Primarily it was designed for web application testing. But it offers other testing as well like functional test, load test, regression test, stress test. Like SoapUI, JMeter also supports custom scripting to extend its functionalities. It can be easily integrated with 3rd party Open Source libraries for Maven, Graddle and Jenkins. It supports multi-threading framework where you can run different functions by separate thread simultaneously. Testing a web service in JMeter starts with a test plan. 1. SoapUI generates SOAP request automatically from WSDL file. But in JMeter, developers have to build the sample request XML. 2. Both the applications have good online documentation and big user communities. This is mainly because of easy-to-go user interface and SoapUI automation. Once you import WSDL in SoapUI, it shows all available operations and request XMLs. Also it can auto generate test cases. Besides these advantages of SoapUI, JMeter is a good alternative testing tool. To download Apache JMeter, click here. Want to learn Apache Jmeter from scratch (Performance + Load testing)? Go through this training course. If you want to test web services without heavy weight SoapUI or JMeter, Postman is the solution. It is the most used REST client worldwide. It has a Chrome browser plugin also. You can install it from Chrome web store. .. because Chrome browser plug-in for Postman will be deprecated in late 2017. Plus there are many extra features in native apps than Chrome plugin. 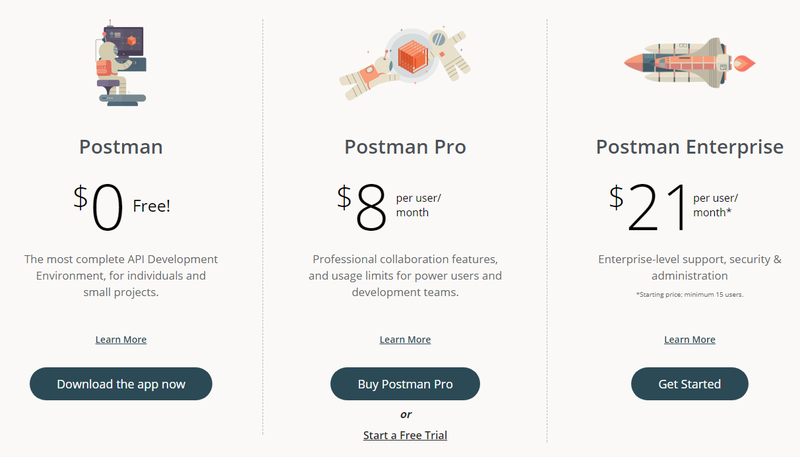 Postman comes with 3 pricing plan – Postman, Postman Pro and Postman Enterprise. If you are not interested in email customer support with multiple time zone or Single Sign-on, Postman Free plan is just enough. Postman user interface is divided into two parts. Sidebar on the left displays history and collection. Request builder on the right is to submit request and verify response. You can read response file easily in Postman response viewer. It offers 3 view modes for body tab – Pretty, Raw and Preview. Pretty mode formats the response file to make it more readable with color coding, line break. Raw mode displays the file in a text area without any formatting. This mode is useful if you want to see minified response file. You can save the request and response file in collection (on the sidebar). Postman displays the body and header information in different tabs. Status code with time details comes next to the tabs. 1. Unlike SoapUI, you have to build custom XML request message in Postman (same as JMeter). However, Postman has an easy-to-go interface to build the XML request. It consists of four parts – URL, Methods, Headers and Body. If you want to see that the web service is working properly or not, Postman is a good option. But SoapUI supports more advanced level of testing. 3. And building SOAP request in Postman is little bit tricky. (Click here to know step by step process to make SOAP request). Do you know the best feature that I like about Postman? It’s super easy team collaboration capability. But this is only for Pro or Enterprise members. Using team collaboration, you can easily share collections and templates, organize APIs, workflows. Want to know more about Postman and Restful web services? here is my recommendation – Rest API automation with Rest Assured and Postman. My third pick as SoapUI alternative is Wizdler. If you don’t need all fancy features of SoapUI, try this one. Wizdler is a browser extension web service testing tool, comes with Google Chrome and Mozilla Firefox. Once you put the WSDL address in the webpage address bar, Wizdler recognizes it and lists down all available services and operations. Click on any available operation and request XML will appear in SOAP request editor. Edit it to pass arguments and click on ‘Go’ to see the response on editor. Unlike Postman, Wizdler can generate SOAP request XML. If your requirement is just to verify request and response XML, Wizdler is a good choice. Google has started to phase out Chrome apps support. So will Wizdler come up as native app like Postman? Primary focus of HttpMaster is to develop and test REST web services and web API applications. You can test SOAP web services also if methods are exposed via http. But it does not support advanced features like WSDL parsing to extract SOAP methods. It has nice, clear and well defined user interface. You can create project, add header and parameters quite easily without any advanced technical skill. You can copy HttpMaster project file (*.hmpr) from one machine to another. If your project file is built in newer version of HttpMaster, you can not open it in older version of the tool. Do you want to give a try? However it has professional edition with LIFETIME license. You have to pay only once to buy the license. No upgrade costs, no subscription costs. Here is the full comparison between express and professional edition. When you compare it with SoapUI, you will find many drawbacks. 1. HttpMaster runs only on MS Windows. To run latest version of HttpMaster, you must have MS Wondoes 7 or above. Also it requires Microsoft .NET Framework 4.5 or later installed in the system. 2. Compare to SoapUI, it has very limited features. It is a good tool to test Restful web services. WebInject is free and open source automated testing tool of web services and web applications. It can automate functional, acceptance and regression testing. In Webinject, you can collect and monitor HTTP response time in real time during test execution. WebInject can be used as a complete test framework, controlled by WebInject User Interface or standalone test runner with other test applications. Its UI is nothing but a small [Perl/Tk] GUI wrapper used to run the WebInject Engine (webinject.pl). However it has few predefined template files to add test cases. You can also create your own template file using any notepad editor tool. 2. Webinject is written in Perl. That means it can run only on that platform where Perl interpreter is installed. Except MS Windows (where binary executables are available), you need to install Perl interpreter on other platforms like Linux, Mac, Solaris. Except these 5 SoapUI alternative applications, you can try Runscope also. But it does not have any free version. Why you are looking for SoapUI alternative? And what is your favourite alternative application? I don’t work so much on stress an load testing, so my primary requirement is for the tool to be able to extract the method call structure and do a quick test of the call before I start any real development. In my last case neither Storm nor SOAPUI are able to understand a particular WSDL. Wizdler does, so yay! Thanks for listing this jewel. I use rest-assured – you have to build your own requests but this can be incorporated with the likes of selenium and other automation tools to provide a full end to end test if required. I use both – SoapUI as well as Postman. If you need lighter webservice testing tool, Postman is a good choice. Nice post! !